I remember teaching my children to say please and thank you even before you could actually make out those where the words they were speaking. It surprised me when one day someone said “You can’t expect a 2 year old to say thank you.” Being a first time new mom I actually stopped to ponder this. Was I doing things wrong already? Quickly shaking myself back to reality I realized that I COULD expect them to say these things. When is a good time to expect your children to be well mannered and are you not supposed to start teaching them things before they actually understand them in the hopes that it will become second nature at some point? Over many years I have been told what polite boys I have and how impressed others are that they say a simple please and thank you. It’s gratifying and disturbing at the same moment…. Is the simplicity of please and thank you such a rare quality in children these days? I look back at that moment my son was 2 and wished I’d been a more confident mother in order to stand up for what I thought I was doing right. Time will always tell if you made the right decision and it did. Ten years later I found myself unemployed. In a situation where I had more time on my hands than I even knew what to do with. I relished in the opportunity to be a stay at home mom while looking for another job. Breakfast turned from Pop Tarts and Oatmeal to Egg sandwiches and pancakes. Field trips could now include me without having to take a sick or vacation day. Dropping them off at school each morning enabled me to yell “Have a beautiful day” as they walked into the building and after school homework became a team effort with my full attention instead of only ‘while I waited for the water to boil’. The rushed mornings and evenings became much more enjoyable as the quality of our time increased. The one thing I didn’t see coming was the feelings I had when expecting the boys to continue to still do their chores. By this point it had changed from the simplicity of the shoe box to dishes and vacuuming with the occasional load of laundry and of course picking up their room. A couple times a week… it’s not much to ask. Right? With a new found 8 free hours on my plate I struggled with the guilt of feeling as if I should be the one to do it all. They still had school, homework and their sports to keep up with. What did I have? I had nothing except volunteering a couple times a week at their school and the occasional helping with a few non-profits around town. The first few weeks felt like a vacation to them I’m sure. Not being responsible for anything but being a kid. They loved it… and I loved it. 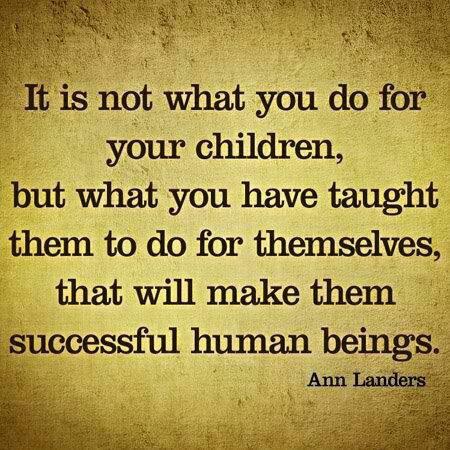 Then I realized… my job as a parent is to teach them to be responsible loving little people so when they grow up they are responsible loving bigger people. One part of doing that is still expecting them to ‘help out’. Was I ultimately doing a disservice to them by taking all their responsibilities away? My answer to this question was yes. My thoughts went back to when they were 3…. I didn’t teach them to say please and thank you for my own good. I didn’t expect them to be on ‘shoe duty’ for my own sake. I was trying to instill responsibility and manners and just because I had more time on my hands does not mean that my long term goal of having self-sufficient children should be pushed to the way side. So I compromised with myself. They still have to do the dishes and vacuum but I cut it down to once a week each per child. They still have to help me load and unload laundry but only on occasion. Their main job is to be responsible for their own things. Put their own clothes away in their proper place and pick up their own toys around the house and yard. They know when they want a few extra dollars for a treat they come ask me if there are any additional chores they can do. I don’t pay them for their main chores because I feel the family home is just that…. It’s all of ours. We are all responsible to keep this place going, clean and happy. It’s a team effort that I’ve tried to instill in them. I am not perfect and they are not perfect. Our house still gets messy even though I have more hours in the day than I ever have. They complain about having to do their chores and argue with me about whose night it is to do dishes. Our life might have changed drastically with me being out of a work at the moment…. But it doesn’t mean my job of raising well rounded responsible young men has changed. In all honesty…. That job description is etched in stone. It will never change for as long as I live no matter what new circumstances arise. My 8 year old will hold the car door open for me and ask me if there is anything he can help with if he senses I’m a bit stressed. My 11 year old vanished out the back door last week just as we were getting ready to leave for school. My gut reaction was to holler “What are you doing? We have to go!” but I found him dragging the trash can to the street without being asked…. I had forgotten… He had not. I stood in the doorway taking a moment to realize that there must be something I’m doing right. Then again… so are they!